The corresponding technical report, Alternative Intersections/Interchanges: Informational Report (AIIR) (FHWA-HRT-09-060), covers four intersection designs and two interchange designs. 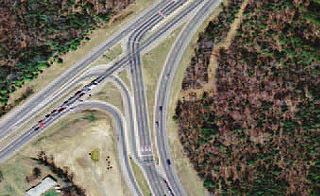 These designs offer substantial advantages over conventional atgrade intersections and grade-separated diamond interchanges. The AIIR provides information on each alternative treatment and covers salient geometric design features, operational and safety issues, access management, costs, construction sequencing, and applicability. 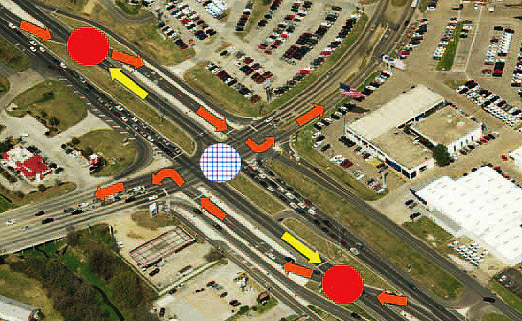 This TechBrief summarizes information on one alternative intersection design-the displaced left-turn (DLT) intersection (see figure 1). Within the figure, the red circles symbolize signal-controlled crossovers; the blue patterned circle represents a signal-controlled main intersection; the orange arrows indicate left-turn crossover movement; and the yellow arrows indicate opposing through movement at signal-controlled crossovers. Figure 1 is a partial DLT intersection where the DLT movements have been implemented on two opposing approaches of the major road. The crossroad left turns are treated identical to a conventional design. Figure 1. Left-turn crossover movement at a partial DLT intersection in Baton Rouge, LA. 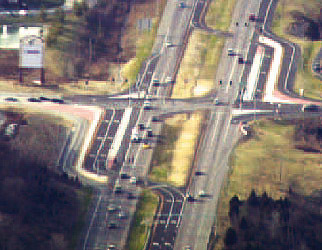 The DLT intersection, also known as the continuous flow intersection (CFI) or the crossover displaced left-turn (XDL) intersection, has been implemented at several locations in the United States. The primary benefit of the DLT intersection is the reduction in the number of traffic signal phases and conflict points with consequent improvements in operations and safety. The main geometric feature of the DLT intersection is the removal of left-turn movements from the main intersection to an upstream signalized location. Traffic that would turn left at the main intersection in a conventional design now has to cross opposing through lanes at a signal-controlled intersection several hundred feet upstream and then travel on a new roadway parallel to the opposing lanes. This traffic is now able to execute the left turn simultaneously with the through traffic at the main intersection. Traffic signals at the left-turn crossovers and the main intersection are operated in a coordinated mode so that vehicles do not stop multiple times in the intersection area. Airline Highway and Seigen Lane in Baton Rouge, LA (see figure 1). Entrance to the Dowling College National Aviation Technology Center in Shirley, NY (see figure 2). The orange arrows in the figure show the leftturn movement from the major road. MD 210 and MD 228 in Accokeek, MD (see figure 3). 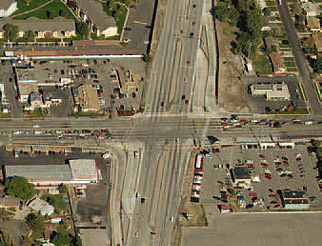 3500 South and Bangerter Highway in Salt Lake City, UT (see figure 4). Route 30 and Summit Drive in Fenton, MO (see figure 5). Figure 2. Left-turn crossover movement at a 3-legged partial DLT intersection in Shirley, NY. Left-turning vehicles are removed from conflict at the main intersection by having them move across the opposing through traffic stream at a signal-controlled crossover 300 to 400 ft upstream of the main intersection. Crossover movement radii can range from 200 to 400 ft.
Access limitations in the vicinity of DLT intersections are likely, as some State design manuals preclude median breaks within 600 to 700 ft of the intersection. Also, driveways near the intersection have to be right-in and right-out. Pedestrians can be accommodated at DLTs at the main intersection (see figure 7). Figure 3. 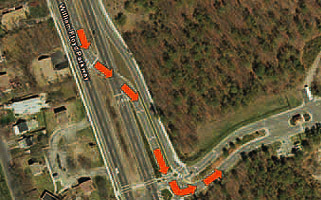 A 3-legged partial DLT intersection in Accokeek, MD. Figure 4. DLT intersection in Salt Lake City, UT. Figure 5. A partial DLT intersection in Fenton, MO. The DLT intersection requires traffic signal control at both the upstream left-turn crossovers and the main intersection. The traffic signal controls are synchronized and therefore operate with just two phases. Typical cycle lengths range from 60 to 90 s and are fully actuated to minimize delay and promote progression. Either single or multiple signal controllers are used. Case 1-Three lanes on the major road intersecting three lanes on the crossroad. Case 2-Three lanes intersecting two lanes. Case 3-Two lanes intersecting two lanes. Case 4-T-intersection with three lanes intersecting two-lane roads. From cases 1, 2, and 3, the full DLT intersection simulations showed a 30-percent increase in throughput over comparable conventional intersections when the opposing flows on the main lines were fully balanced. With unbalanced main lines opposing flows, the throughput increase compared to a conventional intersection was approximately 25 percent. For a partial DLT intersection, the increase in throughput ranged from 10 percent for unbalanced flows to 20 percent for balanced flows. The reduction in observed intersection delay was between 30 and 40 percent for a partial DLT intersection and 50 and 80 percent for a full DLT intersection. For the T-intersection (case 4), the increase in throughput was about 16 percent. These operational gains are also expected to result in substantial environmental gains in terms of reduced fuel consumption and pollution, although these have not yet been calculated. Figure 6. Typical full DLT intersection with displaced left turns on all approaches. With respect to safety, the full and partial DLT intersections have 28 and 30 conflict points respectively, compared to a conventional intersection, which has 32. Results from a simple before-after study of the DLT intersection at Airline Highway and Seigen Lane in Baton Rouge, LA, showed a 24-percent reduction in total crashes and a 19-percent reduction in fatal and injury crashes during the 2 years following installation of the partial DLT. Further research is needed to more accurately quantify the safety benefits of the DLT. Figure 7. Possible pedestrian movements at a DLT intersection. The DLT intersection design offers greater throughput compared to conventional intersections when high and balanced through volumes and high left-turn volumes exist on the approaches with DLT configuration. The design requires some additional right-of-way and therefore may be best suited to areas where rightof- way is not prohibitively expensive. Increased intersection capacity that could postpone or even eliminate the need for future grade-separation intersections. Potential safety measures to reduce crashes at high crash sites. More details can be found in the full AIIR report available from the FHWA. Inman, V.W. (2008). Evaluation of Sign and Marking Alternatives for Displaced Left-Turn Lane Intersections, FHWA-HRT-08-071, Federal Highway Administration, Washington, DC. Availability—This TechBrief may be obtained from the FHWA Product Distribution Center by e-mail to report.center@dot.gov, fax to (814) 239-2156, phone to (814) 239-1160, or online at http://www.tfhrc.gov/safety. Key Words—Continuous flow intersection, CFI, Displaced left-turn, DLT, Crossover displaced left-turn, XDL, and Alternative intersection.